When you play good rugby you control the ball with good rugby handling. See how you pick up the ball well, hold it well and carry it securely so you play rugby confidently. 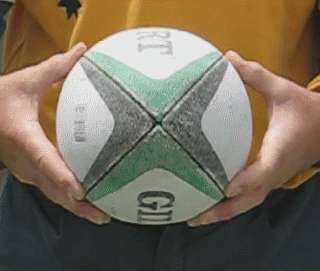 Rugby handling - the cage grip looks like this." How do you handle well? Holding the rugby ball well is all about touch. Many say "You must spread out your fingers". True... and much more is required. Build strong fingers that are responsive to the shape of the ball and use your fingers that mould to the shape of the ball. Create a cage-like structure from which the rugby ball cannot escape. Pick up the ball like this and hold it like this. Put each thumb on a seam and have each set of fingers along the other seams. Avoid touching the ball with the palms of your hands. What is good rugby handling..
You hold the ball well when you develop your handling skills. When you pick up the ball and afterwards - when you move the ball around in relation to your body. Before you pass the ball - you control and prepare to pass. After you catch the ball - you control the ball. Maybe you move it around to avoid having the ball taken away from you. When you run with the ball you control the ball with your hands that`s all rugby handling. You will probabaly even look, sound and feel confident! Maybe you have them already. You may think of a clever way to get them. If not, how do you get them? I`m pretty sure I know. Mine arrived when I wasn`t looking! That means I can`t say for certain "this is how you do it". My fingers developed with gymnastics and climbing but mostly because I played basketball. Basketballs are relatively heavy. I just compared mine with my rugby ball and found it was 40% heavier. It may not seem that much but take care if one hits you awkwardly on the finger you certainly know about it! So, I suggest you spend a good amount of time bouncing and dribbling a basketball. Do it high. Do it low. Do it as fast as you can weaving around controlling the ball. That sort of thing. Have fun, get fit, improve acceleration, coordination. Do it without looking directly at the ball - improve your peripheral vision, ability to watch several things at once. Doing all this will strengthen your fingers, improve their ability to respond to touch and mould to the shape of the ball. Each time the ball bounces back up to be pressed down by your fingers is like another successful catch! You can do thousands and thousands in no time! I`m sure you will feel it is time well spent. Make sure you are good at it with both hands - nobody told me! Practice as much as possible - be sure it`s enjoyable. Always aim to improve on last time. handle perfectly in the game. The more often you handle perfectly in practice, the more likely you will handle perfectly in the game. The idea is you practice enough so whatever you are doing your skills become instinctive. Once you know what to do find ways to concentrate the practice. Be inventive, or pretend you are inventive. To have enough concentrated practice probably means you do a lot of practice by yourself. If you are creative it`s possible. Be confident you can do it and enjoy yourself. Remember handling is a basic rugby skill. Be sure when you are on the rugby field you are mastering it along with your other basic skills. When you have a great sidestep you want to hang onto the ball don`t you? Now go to a rugby handling class. Follow what I do in this video and add some of your own ideas. Next thing you know, you have the best hands on the park!